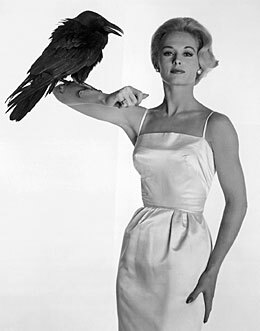 Icy blonde Tippi Hedren starred as Melanie in the movie. Hitch (right) setting a trap. The year 1961 was a listless one for the master of suspense. Alfred Hitchcock had terrified filmgoers the year before with Psycho. What could top that? Loose nukes, looser wives, and a Daphne du Maurier story about a flock of murderous fowl were all considered--and rejected. Frustrated in Hollywood, the director spent weekends brooding at his ranch in Scotts Valley. It was close to the rugged Santa Cruz coastline that reminded Hitch of his native England; he had used it to that effect in 1941's Suspicion. He and his wife, Alma Reville, had installed an electric fence around the 200-acre property and a Georges Braque mosaic in the rose garden. The pear-shaped gourmand entertained Ingrid Bergman, Grace Kelly, and other stars there, taking "a marvelous, malicious delight in seeing his guests fall apart with all those vintage wines and liquor he'd force" on them, recalled actor/screenwriter Hume Cronyn. Santa Cruz had played muse before: Local lore has it that the old McCray Hotel was the model for Norman Bates' house of horrors. (It's now the Sunshine Villa Assisted Living home.) Could the town inspire the portly genius again? On the night of August 17, flocks of the gray seabirds went berserk, slamming into coastal houses, breaking windows, and pecking residents. Santa Cruz awoke to chaos as thousands of shearwaters lay dying. Workers carted away two truckloads of bodies. 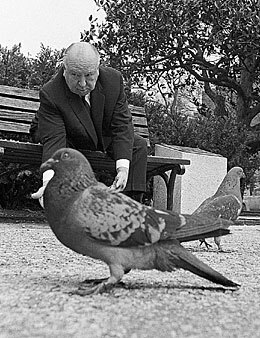 History doesn't tell us where Hitchcock was when he saw the story in the Santa Cruz Sentinel. But biographer Donald Spoto attributes the rekindling of his interest in du Maurier's story "The Birds" to the incident. The resultant screenplay, set in San Francisco and Bodega Bay, even mentions the 1961 invasion. What caused the shearwaters to attack? Scientists at the time said a fog bank hadconfused them. Today, biologists think that an ingested toxin produced the aggressive, erratic behavior. It couldn't have mattered much to Hitchcock, who knew a good story when it flew down his chimney. Universal gave the production the green light. Soon garbage dumps around the Bay Area filled with production assistants attempting to snare a flock of new stars for yet another Alfred Hitchcock production. Andrew Nelson lives and writes in San Francisco. Copyright 2001 - 2002 Andrew T. Nelson. All rights reserved.